On April 16th, TeraThink employees cooked dinner for the families that were currently staying at The Inn. This is the third time we have volunteered to cook dinner. I have to say, it is one of the most rewarding experiences I could imagine. This time, we decided to go with breakfast for dinner and it was a huge hit! 8 pounds of bacon and 100 sausages (amongst many other things) later, dinner was done. One of the moms said to me, “This was a great idea-something different.” Followed by,“Really, anything is good. 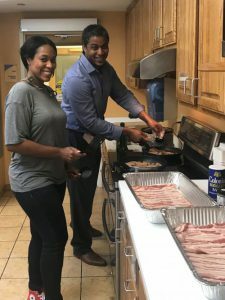 It’s so nice of you guys to do this and to not have to worry about cooking dinner at the end of the day while we’re here.” These families spend the better part of the day seeing doctors. The last thing they want to deal with when they return to the Inn is cooking dinner. It’s easy to see that we are actively making a difference in these family’s lives. Honestly, unbeknownst to them, they are making a difference in our lives as well. In addition to cooking dinners, this year TeraThink also sponsored a “family table” at The Children’s Inn annual Evening for Hope Gala. TeraThink employees were provided with the opportunity to sit with a wonderful family at the gala. This family visits the Inn for follow-ups for the clinical trial their 7 year old boy is participating in. His story aired via video at the gala. Listening to the family speak about what the Inn has done for them was nothing short of amazing. Another Inn resident spoke about her time at the Inn and her story of fighting to survive. Both stories were so moving and made me extremely proud to support such a wonderful organization. 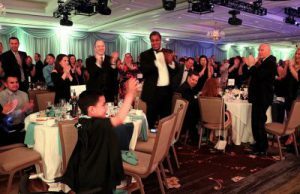 And….drumroll…for the first time ever, the gala raised over $1 million! Having children of my own, this cause hits close to home. Since the time TeraThink formed this relationship with The Children’s Inn and now, a very old friend mine has received a heart-wrenching diagnosis regarding his 4 year old child. Knowing what his family is going through makes it even more important to show up and make a difference for these children at the Inn. No parent (or child) should ever face something like this. While I wish there was more we could do, knowing that we could even lighten the load for them just a little is very rewarding.